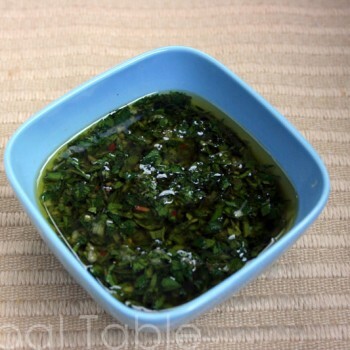 Chimichurri sauce is traditionally served with Beef Empanadas in Argentina. The bold garlic flavor also goes well with any grilled beef. 1. Combine all ingredients in a food processor or blender. Process until a loose salsa consistency is achieved. 2. Let stand at room temperature for flavors to meld, at least 30 minutes. Chimichurri can be refrigerated for a day or two. Serve at room temperature. Combine all ingredients in a food processor or blender. Process until a loose salsa consistency is achieved. Let stand at room tempature for flavors to meld, at least 30 minutes. 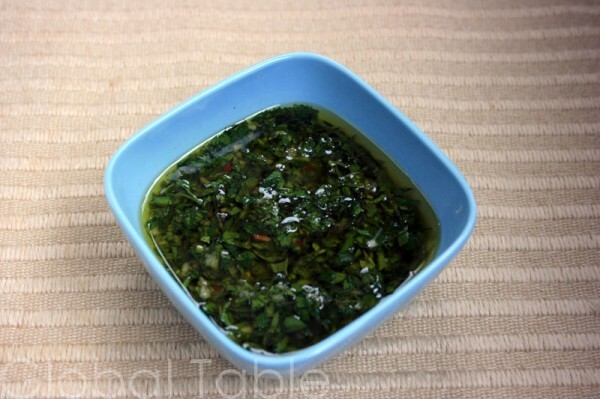 Chimichurri can be refrigerated for a day or two. OK, this was awesome! I made the empanadas and wanted to make the chimichurri sauce to accompany it, but the only other time I had chimichurri sauce at a restaurant, I really didn’t like it. So I went into this one with some trepidation. I served salsa and sour cream also just in case. But everyone loved the chimichurri sauce. The salsa didn’t even get touched. I may have used more oregano than it called for. Thanks Sasha for another exciting new meal!